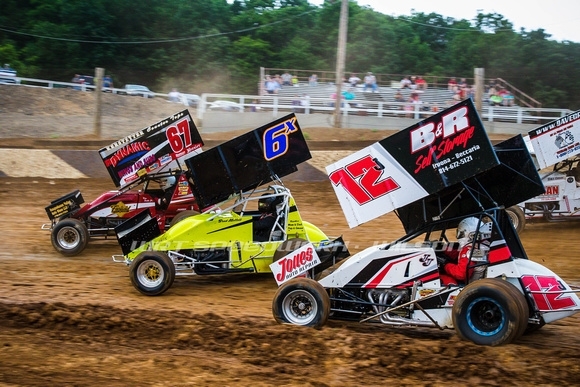 The PA Sprint Series will open its 21st season of competition on Saturday, March 23, at Path Valley Speedway, the first of more than 40 dates on the 2019 schedule. Pre-registrations indicate a strong field for that event, including at least half of the 2018 Top 10 in points and several drivers with past wins at the fast quarter-mile track in northern Franklin County. The sprint cars will run qualifying events and a 20-lap feature, sharing the schedule with 270 and 600cc micro sprints, 4-cylinder thunder cars and 4-cylinder street stocks. General admission is only $10 ($3 for children age 10 and under). Other upcoming dates include: Saturday, April 6, at Port Royal Speedway; Sunday, April 7, at BAPS Motor Speedway; Friday, April 12, at Williams Grove Speedway, and Saturday, April 13, at Path Valley. Also on the season’s schedule are Clinton County Motor Speedway, Hagerstown Speedway, Selinsgrove Speedway, Trail-Way Speedway and Bedford Speedway. New to the schedule is a two-day East Coast Nationals interregional event Memorial Day Weekend (May 24-25) at Hagerstown. The Keystone RaceSaver Challenge interregional event returns to Port Royal on October 12. Zach Newlin became PASS-IMCA’s first repeat champion when he won that title last year. Newlin has announced his intent to return for 2019. Some of 2018’s top runners, including points runner-up Kyle Smith, have decided to move to other divisions, but a strong core of competitors will return, and at least eight rookies have made plans to join the series. Founded to provide lower-cost sprint car racing for competitors and fans in Central Pennsylvania, the series is now part of the International Motor Contest Association, or IMCA, the oldest active auto racing sanctioning body in the U.S. PASS-IMCA is among regional groups throughout the country competing under RaceSaver rules, developed in 1997 by Virginia racer and racing innovator French Grimes. PASS-IMCA was one of the first groups to adopt those rules, following Grimes’ own Virginia Sprint Series. clearly succeeded. While car counts in other divisions continue to decrease at many tracks, PASS-IMCA enjoyed turnouts of more than 40 cars at a few shows last year. Key to that success has been a focus on rule enforcement and rules that discourage extravagant spending, especially on engines. For more information about the series, visit www.pasprintseries.com or visit PASS-IMCA’s Facebook or Twitter pages.